LOS ANGELES — A waterfront shopping center in Marina del Rey with New England architectural themes, boat docks and a lighthouse could be completely revamped. 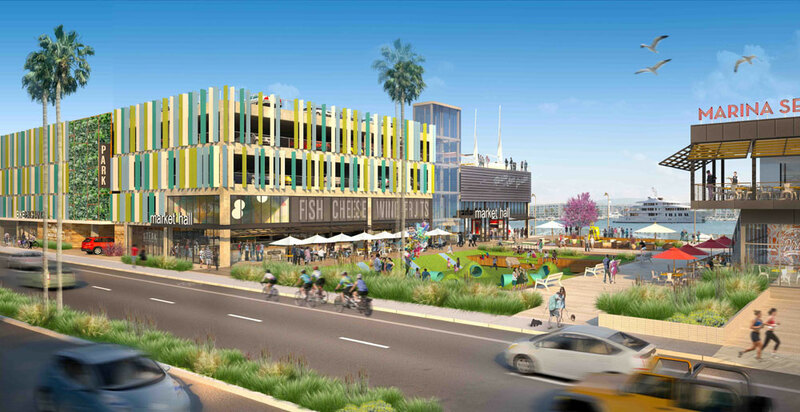 The redevelopment team of Marina del Rey’s Fisherman’s Village appeared in front of Los Angeles County’s Small Craft Harbor Commission on May 13 to present its preliminary plans of how the waterfront venue on Fiji Way could look before the end of this decade. Alan Pullman of Studio 111 Architects said the project is based upon the Marina del Rey Visioning Process and mission. Pullman added the current concept calls for a portion of the redevelopment project to include a 28-foot wide promenade adjacent to the waterfront, with views of boats and the marina. “Water activities are a key component of this [redevelopment project],” Pullman said, adding the Ferry Building in San Francisco serves as a model for the redevelopment. The commission acknowledged, while locals might feel nostalgic about Fisherman’s Village, the waterfront venue has suffered a decline of visitors since the 1980s and could benefit from a redevelopment. A representative of Gold Coast Village LLC, the property management company for Fisherman’s Village, said the new waterfront venue would cater to boaters. Attorney Aaron Clark said the redevelopment plans will be costly and time-consuming, but the end product will make everyone’s patience worthwhile. “It is a complicated project. It is a very expensive project, but it’s one, I think, the community will enjoy when it’s all done,” Clark said. One concern raised by the commission was parking. Specifically, while the commission complimented the overall concepts presented by Clark, Pashaei and Pullman, at least one commissioner wondered if a successful project could create a parking shortage. Daniel Ginsberg of FantaSea Yachts, a passenger boat company in Marina del Rey, also expressed concern about parking and requested the development team preserve Fisherman’s Village’s charter docks. “The final plan for Fisherman’s Village must preserve the charter docks and corresponding parking for the 100,000-plus visitors coming to the marina each year,” Ginsberg told commissioners. Pashaie replied the site is “self-sufficient” for parking, with more than 1,000 spaces available for visitors. Several speakers during public comment commended the overall vision of the redevelopment project but its biggest weakness is it would “destroy” Fisherman’s Village. Some speakers questioned why current plans would do away with the lighthouse feature. Marina del Rey resident Gene Pomerantz said he did not want Fisherman’s Village to be taken down and questioned whether its redevelopment would financially benefit or burden Los Angeles County. Plinio Garcia, who lives in Marina del Rey and owns Indy Plush in Fisherman’s Village, said he gathered more than 500 signatures as part of a petition to urge the county retain the waterfront venue’s overall designs and themes. “Fisherman’s Village is probably the only thing left in Marina del Rey that is part of the original Marina del Rey,” Garcia said, adding visitors and his fellow storeowners want to see the waterfront venue upgraded, not replaced. He also said adding 1,500 vehicles to Fisherman’s Village would be a burden to law enforcement and emergency response teams. Pashaie responded many of the structures at Fisherman’s Village are seismically unsafe and need to be rebuilt to bring them up to current code. He added the redevelopment team would listen to community concerns and include a new lighthouse feature if it were desired. Current plans call for a waterfront promenade, hotel development, children’s area, high-end retail, new restaurants, a parking garage and expanding boater access. Fisherman’s Village currently sits on 1.2-acres of waterfront land on Fiji Way in Marina del Rey. The redevelopment team said the planning process is still several months away from picking up full steam, meaning civic leaders and members of the public ave time to provide input on design and other elements. Other agencies, such as the Board of Supervisors and California Coastal Commission, must also provide approvals before the project could go forward. When all is said and done, the redevelopment project could take three years to go through the public process.